If you identify as a bit of a clean freak, then you’ll be familiar with many of the germ hotspots you encounter around your home, workplace, or when you’re out in public. From toilet seats to door handles, we all think that we know the most common places where unwanted germs and bacteria are found, and take steps to avoid coming into contact with them. Whether that’s opening doors with the backs of our hands, or lining the toilet seat with toilet tissue before sitting down, we all have our go-to techniques that we believe will keep the germs away from us! 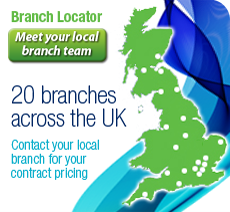 But when it comes to those germ hotspots, are we really looking in the right places? You may be surprised as to where the bugs are really found – and your regular cleaning routine may never be the same again! It’s perfectly reasonable to believe that in a public or workplace washroom, the dirtiest place would be the toilet seat. However, it’s been scientifically proven that toilet seats are actually one of the cleanest places in the room, and that there are countless everyday items and places that tend to be far dirtier – in fact, you’re probably using one of them right now! 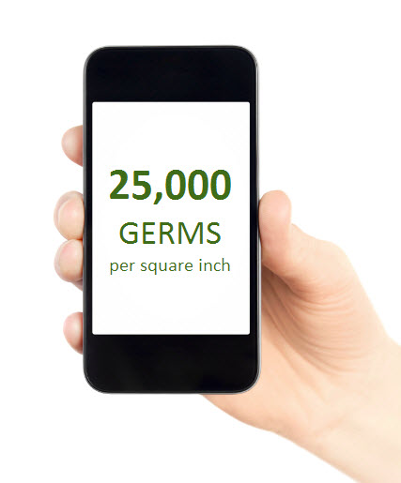 A study conducted by Dr. Charles Gerba, professor of microbiology at the University of Arizona, revealed that with 25,000 germs per square inch, mobile phones carry 10 TIMES more bacteria than most toilet seats. This is because toilet seats tend to be cleaned regularly with washroom cleaning products, whereas mobile phones are not, and they’re also touched and handled many times throughout the day. And if you thought your computer or laptop was any better, then think again! Consumer watchdogs Which? conducted a study at their own London offices and found that their computer keyboards had up to FIVE TIMES more germs than the toilet seats. When you consider how much time we spend at our desks, including to eat and drink, that’s pretty gross. 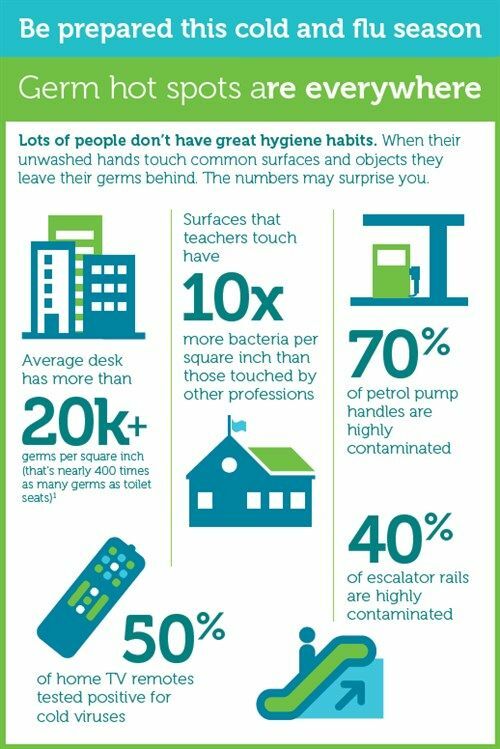 In addition to this, an infographic produced by Kimberly-Clark Professional as part of their Healthy Workplace Project revealed that with over 20,000 germs per square inch, the average office desk has 400 times more germs than toilet seats. So when you’re working hard, your immune system clearly is too! But just in case you weren’t convinced, here are yet 10 more things that have been found to be dirtier than a toilet seat. Prepare to be shocked! Even if you still can’t bring yourself to stop covering the toilet seat with paper before you sit, here’s something to consider: it can actually make germs more likely to come into contact with your skin. That’s because toilet seats are designed to prevent bacteria from spreading in the first place. They have smooth, rounded plastic surfaces that make it difficult for germs to attach to them. In fact, Professor Val Curtis from the London School of Hygiene and Tropical Medicine told The Huffington Post UK that any bacteria living on a toilet seat would most likely be “dead” within an hour. On the other hand, toilet tissue is absorbent and is kept next to the toilet – which makes it more likely to absorb germs from the air when the toilets are flushed. So when you sit down on toilet paper, you’re exposing yourself to more bacteria – although it’s incredibly unlikely that you’ll get sick from a toilet seat, whether it’s lined with toilet tissue or not. On the whole, you’d be better off following our tips on how to protect yourself from germs in public washrooms, which include practicing good hand washing techniques. Will you clean up in our tough ‘Which has more germs’ quiz? Now that we’ve opened your eyes to some of the areas and objects that are dirtier than toilet seats, why not take our ultimate ‘Which has more germs?’ quiz to test your knowledge of other things that are prone to harbouring bacteria. In the quiz we’ll present you with two items, and you’ll have to guess which one has been found to have more germs. Leave us a comment below with your result – and tell us which one you were most surprised by! If all of this has got you thinking about improving your cleaning routine, take a read of our article about the powers of biological cleaning products, or continue the fun with our infection control quiz! ← Odour Neutralisers Vs. Fragranced Cleaning Products: What is the Difference? The questions about computer parts didn’t surprise me, as the commentary says, toilets get cleaned and with strong cleaners, keyboards and other office equipment not so much and not so thoroughly. I got 50 % . Shocking ! Love this Super Clean Quiz ? Waste Management: How Can You Reduce Environmental Impact Of The Workplace? How Clean Is Your Office Water Cooler?